Pressure washing can bring “new life” to the surfaces around your home that accrue dirt, dust, pollen, mold, algae, and any other unsightly debris that can leave your home looking less desirable than it should. We clean many different types of decks made out of many different products. Decks can be painted, treated, stained, or bare wood. 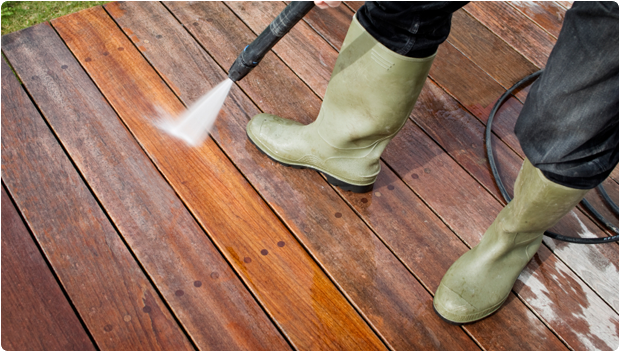 If your deck is treated in any way, we use a very non-abrasive method for cleaning. For untreated wood surfaces we spray a bio-degradable wood cleaner, scrub the product in, and then rinse the deck with low pressure. The wood cleaner helps to remove penetrated stains and also bring a brilliant glow out of your wood. 1. We move your outdoor furniture, umbrellas, cushions, etc to a safe area. 2. We wet and rinse your home from the gutters to the ground to remove the surface dirt. 3. We apply a chemical wash with extremely low pressure from the gutters to the ground on the painted surfaces and allow it to sit. 4. We rinse thoroughly with extremely low pressure to remove all of the dirt, mold, mildew, and chemical wash from your home leaving you with a very clean look! 5. We put all of your furniture, floor mats, umbrellas, cushions, etc back where they belong. Contact us today at (425) 512-5323 to discuss your pressure washing needs.